The global market for reset integrated circuit (IC) is heavily influenced by the growing demand for consumer electronics across the world. The significant increase in the user base of smart phones, tablets, laptops, and wearable gadgets, such as smart watches and smart helmets, is also boosting the demand for reset IC as these electrical gadgets are prone to frequent voltage fluctuations, which can damage their internal circuitry and lead to their malfunctioning, and the usage of reset ICs will prevent the devices from under-functioning and other damaging effects. In 2016, the global market for reset IC was worth US$1.39 bn. Rising at a CAGR of 12.50% between 2017 and 2025, the opportunity in this market is likely to reach a value of US$3.92 bn by the end of 2025. In terms of volume, the market is estimated to account for 6,100.8 mn units over the same period of time. The global market for reset IC is spread across the Middle East and Africa, Asia Pacific, Europe, North America, and Latin America. Presently, Asia Pacific is leading the global market and is expected to remain doing so over the next few years. In 2016, this region held a share of more than 60% of the overall market. Over the coming years, the growing demand for office automation products, IT hardware, and consumer electronics such as smart phones, tablets, laptops, is likely to boost the Asia Pacific market for reset IC substantially. The significant growth in the Asia Pacific semiconductor industry, thanks to strong government initiative policies in the form of tax exemptions, subsidies, and the increasing grants in research and development activities, is also projected to reflect greatly on the Asia Pacific reset IC market in the near future. The improving economic condition and the increasing disposable income, leading to a rising demand for smart phones and tablets, are some of the other important factors behind the growth of this regional market. North America, amongst other regional markets for reset IC, is expected to witness a considerable rise in its valuation over the forthcoming years, thanks to the technological advancements in the medical and healthcare industry in this region. Based on the end user, the global market for reset IC is categorized into the consumer electronics, automotive, industrial, and various other sectors, such as information technology, telecommunication, healthcare, and defense. The demand for reset IC has been higher from the consumer electronics sector and is followed by the automotive industry. Researchers expect this trend to remain so over the forthcoming years, albeit at the cost of a few shares of the consumer electronics industry since it is already matured. Currently, the production of tablets and laptops has slowed down a bit and the manufacturing of smart phones – although their demand is significantly high at present – will gradually decline in the near future. The automotive sector is anticipated to the report an exceptional growth rate over the next few years, owing to the increase in the connectivity systems in vehicles, such as driver assistance systems, navigation systems, and infotainment systems. Texas Instruments, ST Microelectronics, On Semiconductors, ROHM, Linear Technology, Analog Devices, Maxim Integrated, Cypress Semiconductor, Intersil Corp., and Renesas Electronics are some of the leading manufacturers of reset integrated circuits across the world. This report covers the analysis and forecast of the reset integrated circuit (IC) market on a global and regional level. The study provides historic data of 2016 along with forecast for the period between 2017 and 2025 based on volume (Mn Units) and revenue (US$ Mn). It provides a decisive view of the reset integrated circuit (IC) market by segmenting it based on voltage rating, end-users, and regional demand. The voltage rating and end-users segments have been analyzed based on current trends and future potential. The market has been estimated from 2017 to 2025 in terms of volume (Mn Units) and revenue (US$ Mn). Regional segmentation includes the current and forecast demand for North America, Europe, Asia Pacific, Latin America, and the Middle East and Africa. These have been further sub-segmented into countries and regions with relevance to the market. The segmentation also includes demand for individual applications in all regions. The study covers the drivers and restraints governing the dynamics of the market along with their impact on demand during the forecast period. Additionally, the report includes potential opportunities in the reset integrated circuit market on the global and regional level. It further encompasses market attractiveness analysis, wherein applications have been benchmarked based on their market size, growth rate, and general attractiveness for future growth. The market has been forecast based on constant currency rates. Prices of reset integrated circuit (IC) vary in each region and are a result of the demand-supply scenario in the region. Hence, a similar volume-to revenue ratio does not follow for each individual region. Individual pricing of reset integrated circuit (IC) for each application has been taken into account while estimating and forecasting market revenue on a global basis. Regional average price has been considered while breaking down the market into segments in each region. The report provides the size of the reset integrated circuit (IC) market in 2016 and the forecast for the next nine years up to 2025. The size of the global reset integrated circuit (IC) market is provided in terms of both volume and revenue. Market volume is defined in Mn units, while market revenue for regions is in US$ Mn. The market size and forecast for each product segment is provided in the context of global and regional markets. Numbers provided in this report are derived based on demand generated from different applications. Market estimates for this study have been based on volume, with revenue being derived through regional pricing trends. The price for commonly utilized grades of reset integrated circuit (IC) in each application has been considered, and customized product pricing has not been included. Demand for reset integrated circuit (IC) has been derived by analyzing the global and regional demand for reset integrated circuit (IC) in each application. The global reset integrated circuit (IC) market has been analyzed based on expected demand. Market data for each segment is based on volume and corresponding revenues. Prices considered for calculation of revenue are average regional prices obtained through primary quotes from numerous regional suppliers, distributors, and direct selling regional producers based on manufacturers’ feedback. Forecasts have been based on the expected demand from reset integrated circuit (IC). 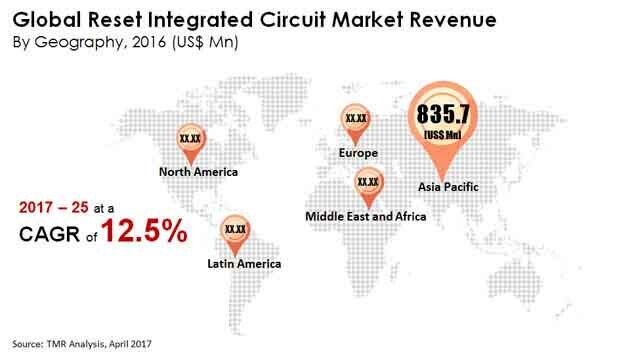 We have used the top-down approach to estimate the global reset integrated circuit (IC) market, split into regions. The voltage rating and end-users split of the market has been derived using a top-down approach for each regional market separately, with the global voltage rating and end-users segment split being an integration of regional estimates. Companies were considered for the market share analysis based on their product portfolio, revenue, and manufacturing capacity. In the absence of specific data related to the sales of reset integrated circuit (IC) of several privately held companies, calculated assumptions have been made in view of the company’s product portfolio and regional presence along with the demand for products in its portfolio. The report covers a detailed competitive outlook that includes market share and company profiles of key players operating in the global market. Key players profiled in the report include Texas Instruments (U.S.), ST Microelectronics (Switzerland), Linear Technology (U.S.), Analog Devices (U.S.), On Semiconductor (U.S.), ROHM (Japan), Cypress Semiconductor (U.S.), Maxim Integrated (U.S.), Renesas Electronics (Japan), and Intersil Corporation (U.S.) among others.